Find and read all the latest Las Vegas Express Bus reviews from fellow bus travelers. These verified Las Vegas Express Bus reviews have been submitted from real customers who booked their Las Vegas Express Bus tickets on GotoBus.com. 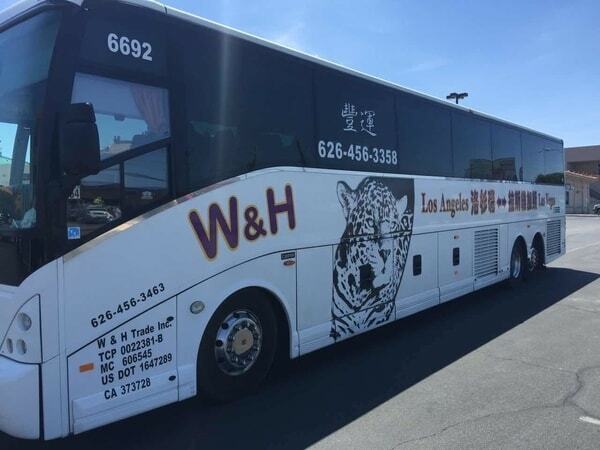 The customer reviews evaluate Las Vegas Express Bus service by rating different aspects such as the bus cleanliness, punctuality, staff and bus comfort. We hope you find them helpful! Find out more about the GotoBus customer reviews program - we look forward to your review! You have screen but no movies. It would be a good idea if you play movies. Also when we stop 10 minutes is not enough since the bathroom line is very long. We need at least 15 minutes to be able to use bathroom and grab something to eat. Always a pleasant trip. Peaceful and relaxing during the drive. The drop off of customers and picking up got quite chaotic as those who boarded found their seat still occupied by passengers that have yet to arrive at their destination. Also, staff spoke minimal english, this route seems to cater to mandarin speaking customers. I’m happy w your service. Thank you! No instruction on where to put luggage in luggage cab, as it pertained to drop off site. No one gave instructions about when to enter the bus. Was not given any information on where the seat numbers were located. Return trip was just horrible. I loved that the bus was not supper crowded. The only thing I can think of is may be some air freshener, since there are some many people. Also may be make sure your driver doesn't smoke pot. Overall experience EXCELLENT! Have lots trash bags at back seats area, didn’t clean up. I have never had to give a tip to the driver in the past, the person in the bus was demanding the tip. I thought that was not right, the lady didn't even speak my language, she was gesturing and getting upset. False Advertisement! Your site lists electric outlet for phone charging, but it's not turn on. Please tell workers not to ask for cash tip when they are lying to us :( thanks! Why are they demanding 10% tip in cash when they don't turn on the electricity to charge our phones, so we can provide our own entertainment for the 6 plus hours drive!?! Good way to travel to Vegas! This is my second time traveling to Vegas from LA, and always a great convenience. For some reason, it seems a more comfortable ride going to Vegas and less going back to LA. Yes, bus is on time and provides restroom breaks. Host speaks Mandarin, Cantonese and English. Seats were a little uncomfortable and cramped. But still an efficient and convenient way to get to Vegas. Awesome. Would highly recommend. Bus departed on time and had rest stops along the way. Would take this bus again on our next Vega excursion! The bus arrived really on time and left on time. Luckily that I called the service to find out the stop is actually at Harris Casino. The staff was very friendly and nice. The bus was really full on that day so I felt really stuffy. But the bus arrived our destination before the expected time which was great. I think I’ll try this bus again. I get almost 2 hours late to my destination! The bus was very dirty and we saw a cockroach on it. It is a friendly bus. I like it except those trash bags hung over on the isles. The guy who’s checking the passenger is so rude, i’ve tried to explaine explained in a nice way if this is the right bus bus for my father who’s 79 yrs old. They even get the e-ticket of my father going cack in Los angeles, my poor father doesnt know what to do, so just print the e-ticket and mail to my father again in las vegas. the plate number of the bus CP87635 bus number 6692. i just hope they hire somebody who knows to speak and understand english, Please dont be rude to your customers. Gotobus.com make things hard to deal with. Your website isn’t user friendly as well, diverting customers to an answering machine and just giving you automated replies and assistance.Customer Service aren’t helpful enough. You have a bunch of misleading informations too making your customers lost and miss their travel especially the first timers. How about choosing the right words like “behind or at the back instead of right next” Example: pick up point RIGHT NEXT TO EASTWEST BANK instead of “right next to 99 Ranch Market. That could’ve been a HUGE help!!! Also, how about making your phone app updated and accurate when it comes to purchased tickets so customers can easily manage their booking using the app instead of trying to call customers service ending up just talking to an automated or recorded messages. Thanks for an affordable enjoyable way to and from !!! The bus in the morning (going to vegas) is clean but on way back to Nogales maybe some passengers insert some wrappers at the side of the chair. The comfort room is always lock. Can they open it while were travelling because sometime passenger cant wait 2hours till next stop over. Other than that, the Driver & staff really nice and accomodating. He even called me to ensure I wont miss my bus. Thank you so much for that. Overall the ride is smooth. Better if bus can provide recharge of mobile, free wifi etc.,. Would ride again! !Thanks for my fast and safe drive! Restful ride. I'm not Chinese but they translated. Some riders are inconsiderate by eating food that smells bad. Driver and conductor were very attentive. I'm going to ride again. Insanely rude people. Got angry because I didn’t leave a tip when they were beyond rude. They said it was mandatory. Here’s a tip. Be nicer to your guests and you’ll get money. This bus is great. It gets us to Vegas quickly and safely. Very good! Friendly guy who works the bus. Driver was on time and arrival on time. Perfect. The process of people finding their assigned seats was a bit chaotic. This bus had no leg room, so if your tall (like my husband is) you will be uncomfortable. Do understand the $2 tip per person. Tips should be your own discretion. Bus was late arriving and leaving. Bus should have cup holders. More places to pick up other than downtown (may Studio City or somewhere in the Valley next to the Metro Stations). The conductor told me that my ticket should have a seat no and that even if I have a tkt but no seat no, I'm not guaranteed a seat. I told him I wasn't aware of that. Luckily,my reservation no was on the list. Is this true ? Address should be Tropicana Hotel instead of in front MGM Hotel& Hooter. First Time rider had problem with that. Make sure there is toilet paper in restroom and leave it unlock. We had to walk to the front of the bus to ask to open it. Bus left on time, arrived early, entire experience was very positive. Would take this bus again. The staff are very welcoming and professional. We enjoyed the ride. It was a smooth ride to Las Vegas. The only thing is that you have to listen. They do have a strict policy on being on the bus ON TIME. Arrival time was off by an hour and restroom laboratory was filthy with no toilet paper. Good trip and great way to get to Vegas. Recommend to anyone who doesn't drive. should clean the ceiling of the bus which is full of DUST.....near the vending over the passenger head. This bus is offered with a power plug but the bus did not have any power outlets. I was also forced to tip...I thought this was really weird. I was already gonna tip when getting off but they went around demanding a tip. I wouldn't take this bus line again. This was a great experience. Got to get a feel of what the ride from LA to Vegas was like & it didn't take long at all! I knew once we touched down in Barstow we would be there in no time! I'll most definitely be taking the Vegas Express bus again if I'm not driving!!! The bus has been cancelled just the day before the trip. I had to take a new bus and pay a higher price for a bus which leaving 1 hour after the bus I booked. The person who I presume took care of the trip and bus ask for tips and oblige us to give a certain amount by person. we didn't expect that therefore we were looking for money in our bag and a lot of Chinese people on the bus yelled at us and obliged us to pay. We didn't appreciate it that is why I won't recommend this bus to anyone. Driver and host conducted themselves very professional. I wouldn't recommend this bus service because on pickup time bus arrived one hour late, same seats were assigned to two different people. The same problems happened on my way back. There weren't electric outlet or WiFi. Bus wasn't comfortable but yet clean and nice. Staff was friendly and helpful. I'm disappointed about this time since I couldn't go on the ride. Last time the ride was smooth but little bit late as I waited for the bus. It would also help to provide specific place to meet. The driver is not very consistent as I understand that even though I might have a good driver last time. It won't necessarily means I will have a good driver again next time. Pending to find out. Ticket was advertised on gotobus.com as having power points but they weren't on the bus. Please correct on website. Otherwise the service was great. E Ticket was not emailed promptly.i was an hour away to my destination when it was emailed to me.Despite my missing ticket the co driver allowed me to board without the ticket. I didn't care for the assumed tip collected by the assistant,for each direction. He also seemed to be patrolling the aisle a bit much. I didn't care for him. I thought I was buying a ticket from another company that I'd used. 1:30p on the dot, the bus left Chinatown Las Vegas. However, due to Sunday traffic and an accident, we didn't arrive in Rowland Heights till 7:45p when the schedule says 6:00p. If the bus is allowed to detour, they should check for the best route before departure and not try to gain time in other ways. It would be nice to have a charging outlet and/or free Wi-Fi, but for the cost, I'm content. Everything was great, from booking to arrival. My only comment is that if the guide hadn't looked for me, I'd probably miss the bus waiting in front of 99 Ranch market. The bus has the essentials. It'd be nice to have a charge outlet and free Wi-Fi, but for the price, I'm happy. Don't upgrade if they're going to charge more. Wonderful trip & the ticket person made the trip fun with his personality. Excellent ,driver n assistant very cordial and helpful. Is there really $2 mandatory tip per person? I received my confirmation for my departure but upon trying to trade my departure to a later time my CC was declined an when I tried to check on my original departure I was told that the info was not available. The experience would have been perfect if not for two exceptions. There was very little English direction. Also,we HATED the fact that one employee had walked around requesting tips for the driver. It wasn't the action. It was how he did it. We first didn't even understand why he was collecting. But then he hovered over us to give a tip and would not leave. We truthfully had only one dollar in cash so we gave it feeling obligated. We gave it to him and he just stared at us, shook his hand as if prompting for more, and then gave us a judgmental look when we had no more to give. I also noticed that he made two other passengers nervous because they were literally looking for any change they had. But again, he just stood there as they dug through their purses. I would travel with this company again but I will never give another tip. I should not feel obligated or forced to tip someone for doing a job they are already getting paid to do. That is absurd. Thank you for the safe travel but I hope this gets fixed. Very disappointed with my eticket. Have a hard time receiving my eticket. I have to use my proof of purchase from my credit card to board the bus. luckily, they honored it. Bus driver was very efficient. This was the best ride I've had, and I travel a lot going through gotobus.com. Bus was scheduled to arrive at Tropicana Hotel at 12:10pm. The bus was at capacity and for whatever unknown reason, the bus stopped in Hacienda Heights for an hour. We did not arrive at the scheduled and desired time of 12:10pm, arriving after 1:30pm. Worst service, very late, driver and TIP collector very rude. Having this bus to take you to a destination you wanted to is big plus and more convenient as opposed to driving and all the works of the long travel but overbooking to the extent of finding that you are on the brink of being left behind and not sure if you will have a seat after confirming the reservation and finding out that the dispatcher gave the seat to another passenger is not a good practice of business.My experience with Gotobus and taking it again for the next time is something that I have to think about. OVERALL this trip is well unorganized and frustrating . Our return to Los Angeles was a big MESS. We are scheduled to return Sunday MAY 15 @12:30pm departure and it was rescheduled for 630 pm instead... Our schedule was screwd up. Excellent trip. Very friendly staff and great bus driver. The bus trip to Vegas did not have the restroom opened and their excuse was they did not want odor. Perhaps if they paid for proper maintenance and sanitizing deodorant chemicals then they could provide a restroom facility for their customers. The trip back had an opened restroom but it flushed with feces water! Again, too cheap to properly maintain a sanitized and clean facility. Americans with Disabilities, beware before you book with this bus lines.